Adding fish to your child's diet is an excellent way to reel in a prize catch of important nutrients. Most seafood (fish and shellfish like shrimp) that's eaten in the United States provides a tasty, safe and healthy mealtime option. But there are a few types of fish children should skip, or eat in limited amounts, to avoid exposure to high levels of mercury. 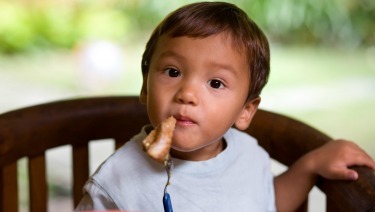 One fish, two fish: How much fish should kids eat? In addition to high-quality protein, vitamins and minerals, fish is a great source of healthy fats such as docosahexaenoic acid (DHA) that are essential for a child's developing brain, nervous system and vision. To avoid missing out on these nutritional perks, children should eat small servings of a variety of fish and shellfish 1 to 2 times per week. Why are some fish better choices than others? Mercury. Some lakes, rivers, oceans, and other bodies of water can be contaminated with mercury. This naturally occurring metal is released into the air by burning fossil fuels (coal, oil and natural gas), solid waste, and by some factories. When it settles into water, bacteria changes the mercury into a more dangerous form, methylmercury. Methylmercury can build up in fish--especially ones that eat other fish and live longer, such as shark and swordfish. Eating too much of these contaminated fish can have harmful effects on a child's developing nervous system. Local concerns. The good news is that other water pollutants like polychlorinated biphenyls (PCBs) and dioxins have decreased in recent years, making them less of a threat to people's health. However, they can still be found in the water and soil in some areas and levels may vary by location and type of fish. For information about the safety of fish and shellfish caught in your area, contact your state and local health departments. If your family likes to go fishing and cook what you catch, check local advisories first. If the body of water in your area isn't monitored, limit how much of the fish you eat to one serving per week. The Federal Drug Administration (FDA) also recommends removing the skin, fat and internal organs before cooking and eating what you catch. That's where water pollution a fish was exposed to would collect. Tuna. "Light" is best. The EPA and FDA rank canned light tuna (solid or chunk) to be among the "best choices" for children to eat, recommending 2-3 servings a week. "Light" tuna, which means it has a pinkish color, includes species such as skipjack. This is considered a better choice than white (albacore) and yellow fish tuna, although these are still considered "good choices," with 1 serving a week recommended. More good choices. Salmon, trout and herring are considered low in mercury and high in brain-boosting DHA. Other types of seafood considered "best choices" include shrimp, cod, catfish, crab, scallops, pollock, tilapia, whitefish, trout, perch, flounder, sole, sardine, anchovy, crawfish, clams, oyster, and lobster. Getting your kids hooked on fish, and knowing how to make safe seafood choices, is a nutritious and delicious way to give them what their growing bodies need. Ask the Pediatrician: Is it safe for my child to eat sushi?